Hello david, used to do handle an eggless version of this dessert we utilized condensed milk as opposed to the sugar and honey and I used baking powder and baking soda rather than the egg, rose essence in the place of vanilla and almond, and liquid in the place of milk only a little variation in quantities was also done…and I utilized a few drops of green shade to make the dessert green and I used exactly the same icing like your dessert, i simply included cardamom dust. The cake turned out extremely smooth and moist and my loved ones liked it a great deal. Many thanks for the concept and determination, david. 1. Preheat the oven to 350°F (180°C). Butter a Bundt cooking pan. 2. In a food processor, grind the pistachios to a powder. 3. With a standing or handheld electric mixer, overcome the butter and condensed milk until light and creamy. Add the flour, powdery pistachios, baking soda and powder and beat really. Adding water and rose essence and beat really. Add the essence and, if desired, the green meals shade and beat once again. 4. Pour the batter in to the prepared cooking pan and bake for 30 to 40 minutes, or until the dessert is cracked above and a toothpick placed in the heart of the dessert happens clean. Take a peek during the dessert after around 25 to thirty minutes and, if it is beginning to brown quite a bit, loosely protect the cake with aluminum foil to stop the most effective from becoming too brown. 5. Allow the dessert cool in pan for 10 minutes, after that invert the cake onto a wire rack and allow cake cool completely. 6. As the dessert cools, combine the confectioners’ sugar, butter, honey, cream, and cardamom in a small saucepan over medium-low temperature. If you prefer a simple, runny glaze, heat simply before the combination is combined. Eliminate the glaze from heat. If you like a sticky, candy-like glaze, cook, stirring continuously, before mixture starts to bubble. Continue steadily to prepare, however stirring, for 1 min. Remove the glaze through the temperature. 7. Slowly spoon the hot glaze on the cake, allowing it to drench in some between spoonfuls. A few of the glaze will inevitably run-down the edges associated with the dessert. 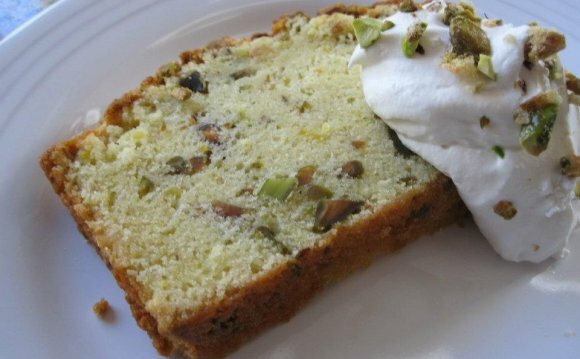 Sprinkle the broken pistachios throughout the dessert and let it sweet for an hour before slicing and serving.